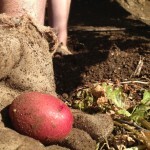 Our annual microfarm potato harvest is one of my favorite spring events. I love spending all morning outside. On my patio, wearing my fluffy pink bathrobe, I flip through fashion and food magazines and sip freshly brewed coffee in the shade of my giant turquoise umbrella while my husband pulls up potatoes. It feels so rustic! 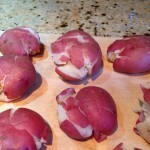 The spuds were planted in December. The Husband has been waiting for the green potato tops (the stuff that grows out of the potatoes) to wither and die which means those babies are ready to come out of the ground. 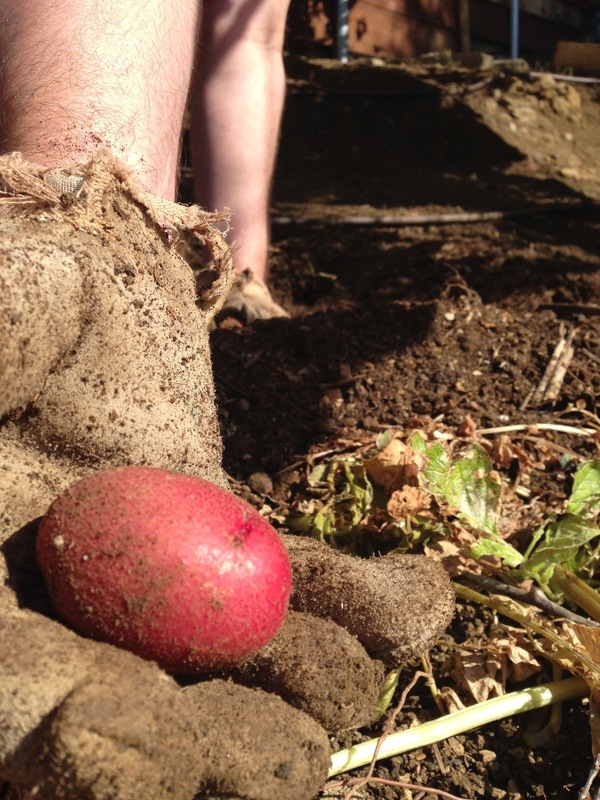 He gently digs and scoops around the edges to reveal lovely, red, organic potatoes. This year’s crop yield is more than 6 pounds! And I feel virtuous because he’s making use of a *paper bag I paid 10 cents for at Trader Joe’s to gather them up. My chickens peck and scratch around the fresh, potato-free hole. Worms! Bugs! New dirt! Let’s bury each other! Shouldn’t every day be like this? With champagne? 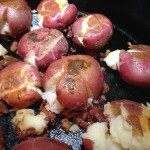 A couple of years ago I tore a recipe out of Sunset Magazine for Olive Pesto Smashed Potatoes. It remains in my kitchen scrapbook. I love it, but I don’t build a fire pit as suggested. Instead I cook up a version on the stove top, preheating my trusty cast iron skillet as instructed for the gas grill method. 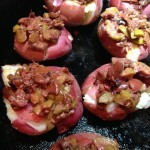 I further cut corners by topping my smashed red potatoes with prepared olive tapenade (yes, from a jar). I’ll call it the simple weeknight preparation. Though even on a Saturday I don’t build a fire pit. I light candles. The recipe calls for pan-roasting the potatoes on both sides which means turning them over. I would have never thought to do this. (Thankfully I take time to flip through magazines.) It makes the potatoes that much more scrumptious. Sometimes not all of my potatoes survive the turn. They can fall apart and the end results look akin to a casserole. So far no one has complained. I totally ♥ potatoes. 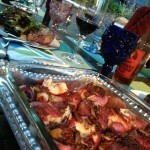 And this is a delicious, savory side dish to accompany whatever’s crowding my small backyard grill. I prepared these on my stove top using olive tapenade from Trader Joe’s. It was my birthday and the grill was busy grilling steaks. On the stove top, topped with olive tapenade. Turned to sear on olive-y side. 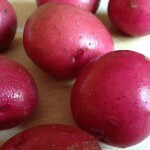 Microfarm potatoes on the table. 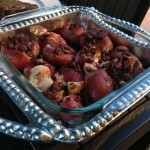 Outdoor birthday dinner with yummy microfarm potatoes. If you’re camping, I hope you have wifi so you can access the recipe and cook your potatoes over a fire. I’ve evaded camping for twenty-some years so I wouldn’t know. *Single use plastic bags are going out of style in California. And a paper bag runs you 10 cents at a grocery store. Best to bring your own, which I always do. Except this one day when I forgot again. Yum! Those potatoes look fantastic! I am probably one few people who have seen and “walked” the micro farm with you while you’re wearing your robe and sipped coffee with you as you explain the various crops while, at the same time, talking to the chickens. I hope to be there sometime when you prepare this dish. Bon appitite. My potatoes are here for you as long as your oysters are there for me. Gosh, I’m getting hungry.